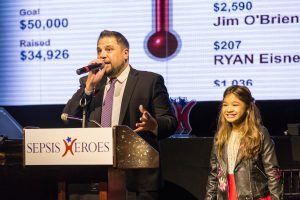 America’s Got Talent star Angelica Hale debuts personal new song about her struggle surviving sepsis, at the 7th annual Sepsis Heroes gala. New York City, N.Y., September 19, 2018 – On September 13, 2018, Sepsis Alliance raised $250,000, at the 7th annual Sepsis Heroes gala, while honoring passionate individuals and innovative organizations dedicated to raising sepsis awareness and improving treatment of sepsis. Sepsis is the body’s life-threatening response to an infection that affects 1.7 million Americans every year. It takes a life every two minutes and leaves thousands of survivors with life-changing effects. The room was packed with heroes, including sepsis survivor Angelica Hale, the 2018 recipient of the 2018 Erin Kay Flatley Spirit Award, presented by Sepsis Alliance founder Carl Flatley, DDS, MSD. Angelica was honored for using her voice as a Sepsis Celebrity Advocate to help raise awareness of sepsis symptoms and the importance of urgently seeking medical treatment when symptoms are recognized. In front of this audience of sepsis survivors and advocates, Angelica debuted her new song, No Time to Waste, which she penned about overcoming life’s trials and was inspired by her personal experience surviving sepsis when she was only four years old. To listen to No Time to Waste, click here. “Angelica’s song No Time to Waste transcends her personal experience and touches not just those of us who have felt the terrible effect of sepsis, but anyone who has ever faced a terrible struggle and survived,” said Dr. Flatley, who lost his daughter, Erin, at the age of 23 to sepsis. For the first time, guests and supporters nationwide were able to text their donations to Sepsis Alliance during the gala, raising over 250,000. The text-to-give portion of the evening was streamed via Facebook Live, allowing Sepsis Alliance’s supporters near and far the opportunity to participate, even if they could not be in New York City for the evening. The 2018 class of Sepsis Heroes range from a sepsis survivor turned advocate in Northern California to one of the few clinics worldwide working to improve patient recovery after ICU discharge. This year’s Sepsis Heroes are Jay Towers, the University of Michigan Post ICU Longitudinal Survivor Experience clinic, Rooks County Health Center, Jill Kogan Blake, and Sharon Hansen. To learn more about the 2018 Sepsis Heroes, visit www.SepsisHeroes.org. Dr. Flatley and Denise Cardo, MD, the Director of Division of Healthcare Quality Promotion, Centers for Disease Control and Prevention, also presented the Erin’s Campaign for Kids Nursing Awards to Andrea Cowan, Mary Kate Abbadessa, and Leigh Cooper. These awards recognize the nurses’ dedication to improving sepsis treatment in their facilities. To learn more about the Erin’s Campaign for Kids Nursing Awards recipients, click here. To view the 7th Annual Sepsis Heroes gala photo album, please click here. Sepsis Alliance would like to thank their 2018 Sepsis Heroes sponsors, which are the Erin Kay Flatley Memorial Foundation, The Shubert Organization, bioMérieux, Pfizer, Thermo Fisher Scientific, Accelerate Diagnostics, BD, CytoSorbents, 410 Medical, Feinstein Institute for Medical Research, La Jolla Pharmaceutical, Wolters Kluwer Health, Children’s Hospital Association, AMITA Health, Edwards Lifesciences Foundation, Edwards Lifesciences, Health Catalyst, Spectrum, Cheetah Medical, Merck, MCN healthcare, KU Medical Center. Sepsis Alliance is the leading sepsis organization in the U.S., working in all 50 states to save lives and reduce suffering by raising awareness of sepsis as a medical emergency. In 2011, Sepsis Alliance designated September as Sepsis Awareness Month to bring healthcare professional and community members together in the fight against sepsis. The organization was founded in 2007 by Carl Flatley, DDS, MSD, whose daughter Erin unnecessarily died of sepsis when she was 23 years old. Sepsis Alliance gives a voice to the millions of people who have been touched by sepsis – to the survivors, and the friends and family members of those who have survived or who have died. For more information, please visit www.sepsis.org. Connect with us on Facebook and Twitter at @SepsisAlliance. Next Next post: Shay M.